Over 8 million individuals signed up for health insurance via the Obamacare exchanges through April 19, according to an official report from the Department of Health and Human Services that confirms an announcement made by President Barack Obama last month. During the six-plus months of the first open enrollment period for these marketplaces created by the Affordable Care Act, 8.02 million people chose a health plan. 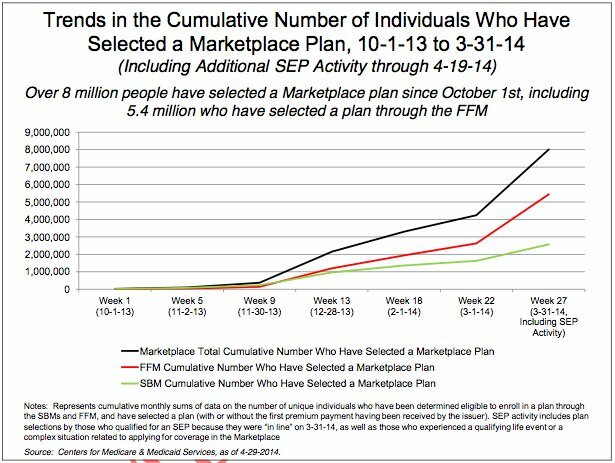 Sign-ups surged during March and April, when 3.8 million signed up for private coverage through the exchanges, according to the department's report. That total represents 47 percent of all enrollments. Eighty-five percent of those customers received financial assistance, the report said. The 8 million total is subject to change in the final accounting, but nevertheless represents a notable rebound from the disastrous October launch of HealthCare.gov, the website for exchanges in more than 30 states, and early troubles for many state-run marketplaces. On Oct. 1, just six people were able to enroll via the federal exchange site, and only 106,000 had signed up nationwide by the end of the month. The tally is also 1 million more than the highest total projected by the Congressional Budget Office. This chart shows the increase in sign-ups via the marketplaces. FFM stands for the federally facilitated marketplace, and SBM are state-based marketplaces. "Because of the Affordable Care Act, more than 8 million Americans now have the peace of mind of knowing their coverage can't be taken away if they get sick and won't run out just when they need it the most," Health and Human Services Secretary Kathleen Sebelius said during a conference call with reporters Thursday. The March and April surge also boosted the share of health insurance exchange customers under the age of 35, a critical metric for the stability of the new state-based markets. Younger customers are considered less costly to insure, so a significant share of these customers -- who tend to use fewer health care services -- is a key counterweight to the costs of covering older, sicker customers. 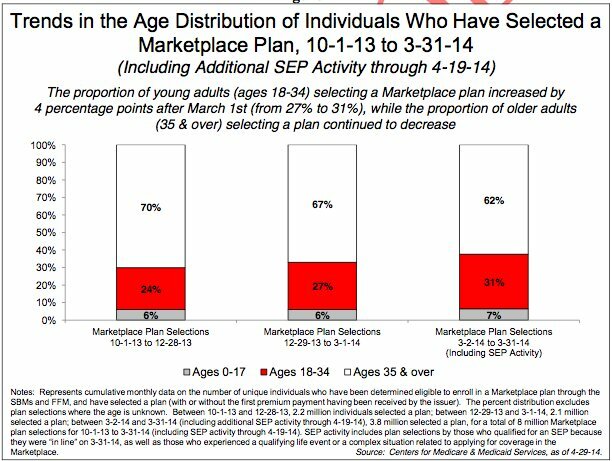 By the end of the sign-up period, 28 percent of enrollees were aged 18 to 34, and 34 percent were under 35, including children. This share fell short of the White House's goal of 39 percent young adults, but the Health and Human Services report shows that 1.1 million younger consumers flooded the exchanges near the nominal March 31 deadline, doubling their participation in the exchanges from the first five months of sign-ups. Although enrollments of young adults came in below the Obama administration's target, the prices on the health insurance exchanges shouldn't be markedly higher next year, Michael Hash, director of the HHS Office of Health Reform, said on the press call. "We believe, based on the data that we've seen and independent data that is out there, that premiums will be stable and that the risk pool is sufficiently large and varied to support that kind of pricing in every state," he said. Mechanisms built into the Affordable Care Act to compensate insurance companies with sicker-than-average customers will help keep prices from spiking, he said. This assessment mostly aligns with guidance from health insurance companies, which also stress that prices for next year will vary geographically to a significant degree. Health insurers already are at work trying to project next year's prices based on meager data from their new customers. HHS did not provide information on how many of the 8 million enrollees have paid their first month's premium and actually activated their health insurance coverage. It won't have that information until later this year, Julie Bataille, a spokeswoman for the Centers for Medicare and Medicaid Services, said during the conference call. The HHS report cites anecdotal accounts from major insurers that have reported 80 percent to 90 percent of customers paid up. Those disclosures are at odds with a House Republican report published Wednesday claiming only 67 percent of enrollees from the federal exchanges had paid by April 15, though that date precedes when bills are due for most of the final weeks' sign-ups. Likewise, the department did not offer data to indicate what proportion of the 8 million private plan enrollees were previously uninsured, but it noted outside analyses from the Congressional Budget Office and others indicating millions have gained coverage since last year. The HHS report said that 87 percent of the 5.2 million exchange users who applied for financial assistance reported being uninsured before, but officials on the conference call stressed that figure is subject to significant uncertainty. The national enrollment figures will shift over the remainder of the year for a variety of reasons. Individuals who never pay a premium or allow their coverage to lapse later will reduce the total. The HHS report also doesn't include enrollments still being processed from states that extended the final deadlines further, including Hawaii, Oregon and the District of Columbia, which were still accepting customers through Wednesday. And individuals who experience a "qualifying life event" during the year, such as getting married or moving to a new state, can access the exchanges before the next enrollment period, which begins Nov. 15. The federal government's report also doesn't include any of the millions of people who purchased an Obamacare-compliant health insurance policy directly from an insurer or broker. Even though these so-called off-exchange purchases aren't tracked by the federal government, those customers are part of the same risk pool as those who used the marketplaces, so their medical bills will be part of the equation used to set next year's prices. In addition to the 8 million private health insurance enrollees from the exchanges, the department reported that 6.7 million individuals were determined eligible for Medicaid or the Children's Health Insurance Program, a tally that does not include anyone who signed up for those programs through state agencies. Since October, 4.8 million people in 47 states have joined these programs, according to a separate report issued by the Centers for Medicare and Medicaid Services Thursday. The Medicaid enrollment total is depressed because 24 states declined to accept federal funding to expand the program to more poor residents.